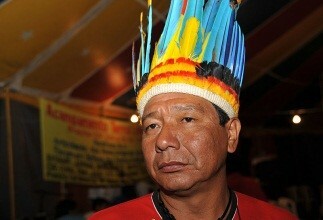 Photo: Anastácio Peralta, a member of the Guarani Kaiowá, Mato Grosso do Sul. Paraguay is sometimes call the Heart of South America. It is bordered by Argentina to the south and southwest, Brazil to the east and northeast, and Bolivia to the northwest. The Guaraní have been living in Paraguay since before the arrival of Europeans in the 16th century, and their language is understood by about 90% of the population. One remarkable trace of the indigenous Guaraní culture that has endured in Paraguay is the Guaraní language, generally understood by about 90% of the population. However, nearly all Paraguayans speak Spanish, which alongside Guaraní is an official language. Small groups of ethnic Italians, Germans, Russians, Japanese, Koreans, Chinese, Arabs, Ukrainians, Brazilians, and Argentines had also settled in Paraguay, and they have to an extent retained their languages and culture, particularly the Brazilians, who represent the largest number at around 400,000. Many of the Brazilians are descendants of German and Polish immigrants. Date 6 May 2009. Source Agência Brasil. Author José Cruz/ABr. Wikimedia Commons. Paraguayan population data are based on blood samples obtained from 168 unrelated individuals living in Paraguay in 2003. Source publication: Paraguayan Population Data on the Fifteen STR Loci Included in the POWERPLEX 16 Kit, JFS, 2003, 253-255.